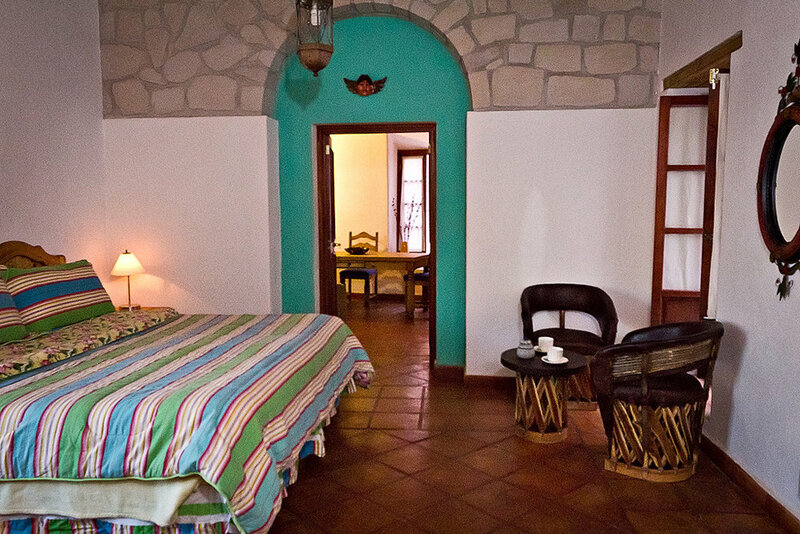 Enjoy the history and romance of Guanajuato from the comfort and style of a recently renovated 200+ year old home. The house is finished in the colonial style with extensive tile, wood beams and hand carved doors. Located in the central historical district, it's an easy walk to the Jardin, Plaza de la Paz and the Mercado Hildago. The Don Quixote apartment is a one-bedroom one-bath apartment with a small kitchen and private street entrance. This rental comes with access to the main house and roof garden. Drinking water is provided. The Boveda Suite is a two-room, one-bath suite on the main floor of the house. The bedroom has a king sized bed with luxury bedding and the sitting room has a refrigerator, coffee maker and microwave across from a comfortable sitting area. Drinking water is provided. The Buena Vista Suite is a two-room suite on the top floor of the house with an en-suite bathroom including a bathtub. The bedroom has a king sized bed with luxury linens and built-in closets. The sitting room opens onto the roof garden and includes a coffee maker, refridgerator and microwave. Drinking water is provided.